I adore the innocence of pretend play, of make believe, of acting out scenes that come to life in a child’s imagination. I love watching kids get lost in their fantasy world. It amuses me watching them mimic and explore this big world by recreating it in play. 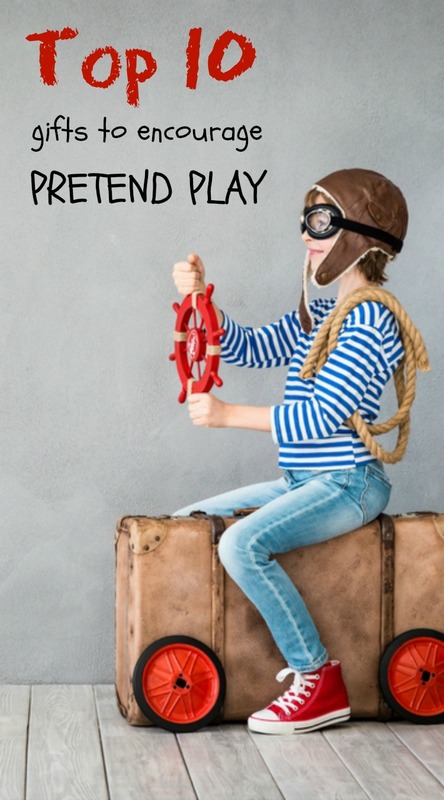 Pretend play is crucial to a child’s development. While the toys for pretend play can’t be defined, there are toys that can help encourage pretend play. Unlike many Top 10 lists, this one is going to be a little different, but hopefully very helpful. Rather than providing a list of specific toys to purchase, you’ll get 10 suggestions of toys to enhance pretend play. And they’ll be accompanied by a brief explanation of how playing with these items is beneficial to your child’s development. So some of the items discussed will be store bought items. In fact, I’ll include some affiliate links to products we love in the text below. However, in pretend play as much as possible it’s best to provide real materials, rather than store-bought toys. A broken or discarded cell phone is better than a toy telephone. Real (but safe) kitchen items are better than plastic play sets. a variety of hats – construction hats, fireman, baseball caps, etc. 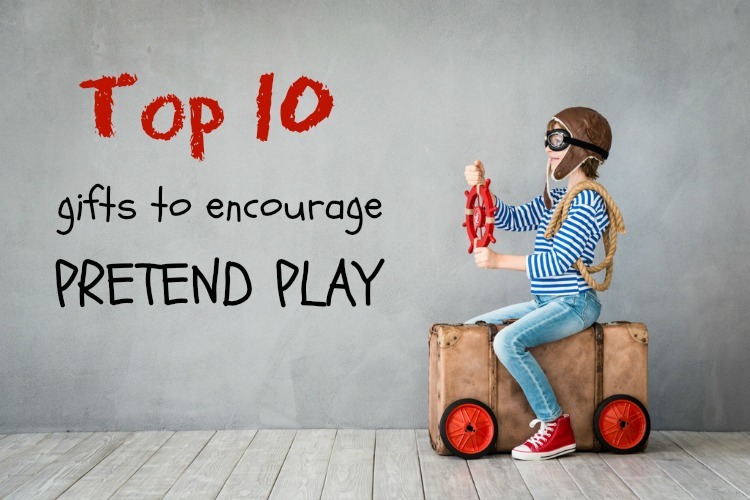 As you read through our list of Top 10 Pretend Play Toys, keep in mind your child’s likes and think about ways that you can enrich their favorite ways to pretend play. Kids love dressing up for a reason… it’s their way of learning. At first I thought this would only be true of preschool age children. However, even as my boys advance through elementary school, they still enjoy putting on an old Halloween costume and transforming into their character. It is their chance to walk in another person’s shoes. While children are mimicking the role of a particular person (mom, fireman, farmer, etc. ), it helps them understand what someone else is going through and helps them understand at a deeper level what it’s like to be that person. Role play also helps vocabulary development. A doctor uses different terms and words in their job than an auto mechanic or a chef. By role playing, a child is learning and using different terminology than they may normally use or be exposed to. Likewise, role play encourages social and emotional development. A veterinarian or nurse often shows compassion for their sick patient. And, if more than one child is playing, pretend play and dress up encourages taking turns, cooperation and socialization. Dress-up play is actually vital to a child’s development. It encourages the imaginative process, allows for play without rules or script, and allows for experimentation, role play and fantasy. While playing superheroes and knowing how to swing from a web to rescue someone may not seem all that essential to us, pretend play promotes problem solving and abstract thinking. Plus, pretending to be superheroes and princesses often makes a child more confident. When they are more confident, their self-esteem is raised. It’s these behaviors and values that are so essential to nurture in a child. Superhero masks & capes — Being a boy mom, I’m pretty much an expert in this area. So here’s my couple suggestions… if your child is a Batman fan, this Batman mask is by far the #1 fought after mask and the mask that gets worn the most in our house (and trust me, we have them ALL)! And… I LOVE this reversible cape! It’s Batman on one side, Superman on the other, and it’s well made! I have to hand it to my boys, they can get very creative while building. Better yet, they role play with their building creations. If Connor makes a combine out of his Tinker Toys, he becomes the farmer and is in the field harvesting. If Dylan makes an airplane out of Bristle Blocks, he is the pilot flying around the room and down the hallway. Check out our Top 10 Building Toys for Preschoolers for a great list of fun tools for building! Nothing says Mr. Fix-It like a little boy with a toolbox full of hammers, drills, and screwdrivers! As toddlers and preschoolers, they had their plastic tools and a toy work bench. Rarely did the boys just “create” at their work bench though. Most of the time, they are fixing truck wheels and working on anything with a visible screw hole! Now that they’re older, Grandpa & Grandma supplied them with their own toolbox and a real set of tools (screwdrivers, tape measure, level, hammer). Of course, the real tools stay in the garage and only come out for projects they work on with Daddy. And the great thing is many of these tools are teaching hand-eye coordination and motor skills with the turn of the screwdriver and learning to pinch with the pliers. Camping to boys is like playing house is to girls. Stuffed animals = dolls. Sleeping bags = baby blankets. Canteens = tea sets. Binoculars hung around the neck = dress up jewelry. A frying pan and foldable silverware = dishes. See what I mean? My boys love using their binoculars and compass to help them find their way! And they often have play bandaids, canteens of juice, and backpacks of play food to trek with them. What can you do to help your kiddos equipped for their camping journey? Make a fort! There are even kid-size tents available. A tent won’t consume your dining room table and could be left up for days on end. However, there is just something extra special and fun about fort making. So grab some blankets and get creative! Dolls and figures allow your child to create their own little world and they give children a way to act out the scenes they see in everyday life. Dolls can be bathed, changed, fed and cuddled which mimics the way you nurture your child. Preschoolers and young school-age children love dolls with a lot of hair and clothing as they are often associated with grooming activities. Dolls that teach self-help skills like buttoning, lacing, snapping and zipping are also good choices. Figurines offers a broader variety. We’re talking about everything from Fisher Price Little People to superheroes and ninja turtles to Barbies. The Fisher Price Little People can be found in farm sets, airplanes, helicopters, school buses. These are a great starting point for toddlers to use figures in pretend play. When thinking of gift giving, think of doll storage like baby beds and strollers, think about clothing changes or hair brushes, or matching outfits for doll and child. For action figures, think about where the action figure/superhero lives. Does your Batman have a batcave? Our boys like to rescue their Buzz Lightyear and other figurines with their Batcoptor. So as you stand looking at the myriad of figurines lining the shelves, think outside the box to what could expand your child’s play with their favorite toy. Until I had boys, I never fully appreciated the many uses of a construction truck! Some of our trucks have a permanent home in the sand box. Our medium-duty construction trucks are often part of our sensory bins and Playdough play time. Our heavy-duty (very large) dump trucks haul the dirty clothes from where they pile on the playroom floor under the laundry chute into the laundry room where they are dumped. Anything can be a construction zone or farmland. My boys stay busy harvesting the rug field in the living room and then driving to the next farm in the family room. They have the system down just like grandpa does with the tractor and grain cart parallel to the combine and the semi waiting at the end of the field for the next load. Hey, if they can’t be in the real thing, at least they can pretend! So while the engine roar and honking noises your child makes for this playtime actually sounds like a Chicago interstate during rush hour, focus on the process of play. Ask your child exploratory questions such as “Where is that truck going?” or “That is such a noisy truck. What is it honking at?” to help extend his/her play. And if you really want to make your child’s day, get on the floor and play next to them! “Why yes, I would like a sandwich made with hamburger, lunchmeat, 3 layers of cheese, all the toppings, an extra bun for support… and I would like it to be 10” long! Thank you!” This is often the scenario when my boys get into “cooking” mode. As I stretch my mouth as big as possible to pretend encompass this mammoth sandwich, giggles instantly ensue. It only take a couple of pretend bites with chipmunk-packed cheeks to make this mommy full, but the feast keeps on coming! Kids must realize that food and bonding go hand-in-hand. Think about how much fun you and your child have when making daddy a special dessert. My boys LOVE being in charge of our big Kitchen Aid standing mixer. They are so proud of this special opening, dumping, closing, locking, turning on big-boy job. Think about the quality time spent around the dinner table. Or the dinner parties and carry-ins with extended family and friends! With these wonderful experiences, why wouldn’t kids want to pretend play with food? For our oldest child’s first birthday, my aunt and uncle got him a child’s music set which included a plastic snare drum, drumsticks, a tambourine, maracas, and a song flute/recorder. Oh what fun he had… and what a headache mommy had! Even 4 years later, it is not my most favorite toy (I do like the little bit of sanity I have left). However, the benefits music plays in child development is what keeps that set in the house. For more details, check out PBS Parents’ “The Benefit of Music Education”. Sing with your child at bath time, while making dinner or doing crafts. Anytime is a good time to sing… even if you’re not good at it, they are just happy to have a duet! So go for it and belt out those lyrics to “If You’re Happy & You Know It”! Make up silly songs about what you’re doing. Its silliness is contagious and soon your kids will be making up their own songs and rhythms. When I was a little girl, I used to pretend play store. I’d use my Speak & Spell as the store scanner, making it blip every time I ran an item over it. It also doubled as a credit card machine… and oh, yah… as a spelling aid too! When we purchased our little cash register for Connor, it was nothing more than a fun motor skill toy with bright colors, buttons to push, a drawer that pops out, and a little bell that dings. However, one dreary inside play day when the boys (surrounded by a plethora of toys) complained they were “bored”, I reminisced back to one of my childhood favorites and taught them how to pretend play store with their cash register. It was a hit! Connor was the store clerk and Dylan was the shopper. Dylan would find all kinds of things on the playroom shelves that he “just had to buy”. He had a pocket full of chunky cash register money that he would hand over upon Connor stating the price of each item. Sometimes Dylan got change back. Sometimes he didn’t have enough money. And sometimes Connor, being the compassionate soul he is, would give him a store discount and just let him have the item. Dylan would “take his purchases home” and come back for more. This didn’t just last 15 minutes, but rather an hour or so and then carried on for weeks. That was just with our toddler cash register. However, there are more elaborate cash register sets with money that is akin to true currency. This is a great way to teach money and have fun playing at the same time! Oh my goodness, working through this list of pretend play items almost makes me miss my imaginary friend from childhood! Parents… don’t push these precious days of pretend play away too quickly. Enjoy the sweetness of this time in your child’s long. The real world will catch up with them soon enough. There are some great ideas here, reminds me of when I was this age and my parents had a huge box of dress up costumes for my sisters and I, we loved it. Although my son is still little, he loves my purse so I gave him his own today with cards and money, he loves it. You’ve listed out some great ideas for us. Thank you! I especially like the tents/camping ideas. 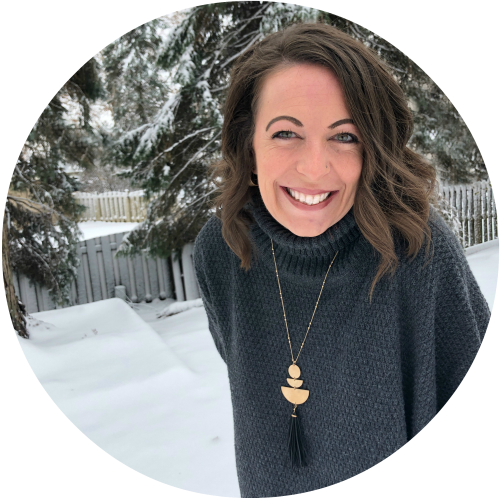 My kids love camping out in the family room or living room during the winter, while waiting for spring to arrive when they can camp outdoors. Great list but don’t forget the boxes they came in as well as an exacto knife and room to stores them. How could I forget pretend play with boxes! Oh my goodness, YES! Boxes are a hit around here. In fact, I recently made a sensory box out of a large box and shipping peanuts that our boys have been driving dump trucks in! They love it! And when they get tired of the box, I let them use their play saw and tear it down. Boxes are loads of fun! Such a wonderful ist! We love pretend play, especially music and building. Thank you for linking up on our Facebook page for Share Wednesdays. Pinned. Thanks! And thank you for hosting your share party! It’s fun to hear everyone’s favorite ways to play!